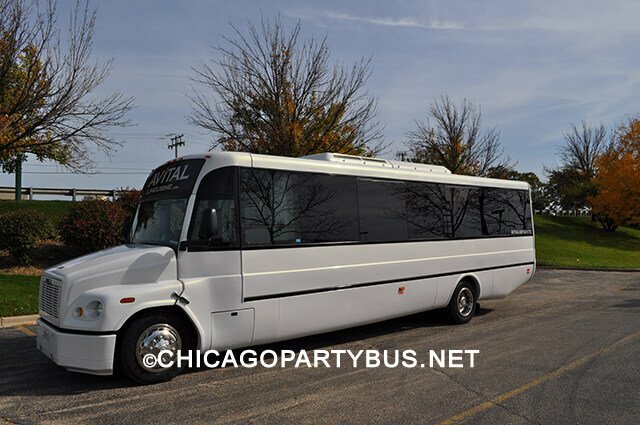 At the present time our fleet consists of the incredible party buses listed below that are more than equipped to handle all your group travel needs! 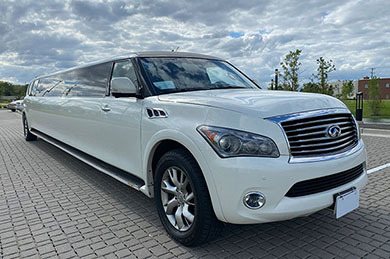 Our professional chauffeurs navigate these vehicles with ease, and they always have your safety in mind first. They take care of the driving so you can enjoy all the perks and features of the buses! Please note that our crew inspects and cleans the buses before and after each trip, so you are always certain of having a truly flawless time on the road. These vehicles are insured to the fullest amount allowed by Illinois law, and that means that you can rest assured on the road. Take a look at our features below! We promise you will be amazed at all of the vehicles we have in our fleet. 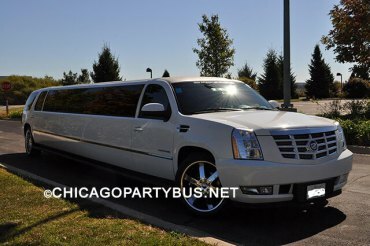 Give us a call today and get your upcoming date booked before it's too late. 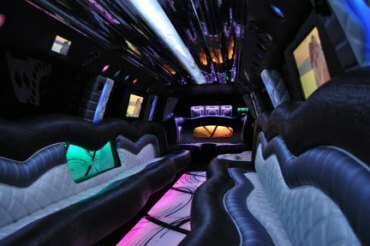 If we don't have the vehicles you're looking for we recommend trying out Atlantic City Party Bus, Fort Myers limo, or Auburn Hills Limo. 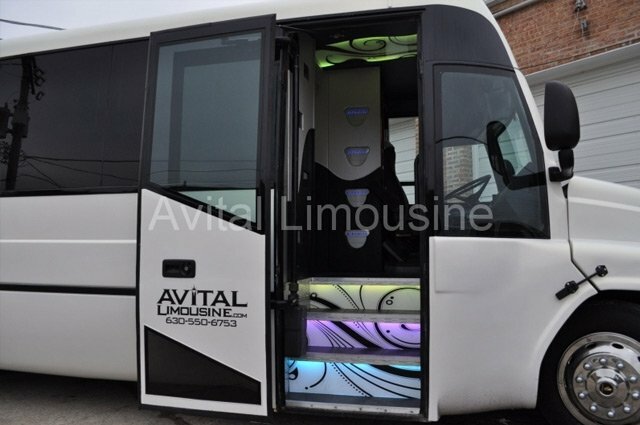 This is the first of our mid-sized options in our current fleet of buses and limos, holding up to 30 guests, with custom leather wraparound seating that is as comfortable as it is plush! There are a couple of large screen LCD televisions in this bus, and you'll really enjoy watching your favorite DVDs on them as you travel! The sound system in this bus is high quality and loud, and you can bring a bunch of your favorite CDs or just bring your iPod or MP3 player. The LED lighting scheme in this bus is really gorgeous, and you'll love the mirrored ceiling as well. 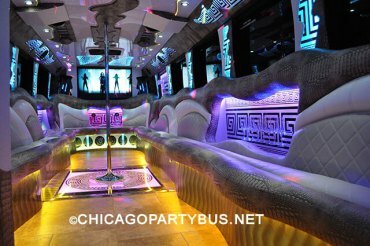 There are wood floors, a beautiful bar area, and even champagne flutes included with this bus. It's air conditioned too, and there's an open driver partition so you can easily tell the chauffeur where you want to go next! This bus is a non-smoking bus. 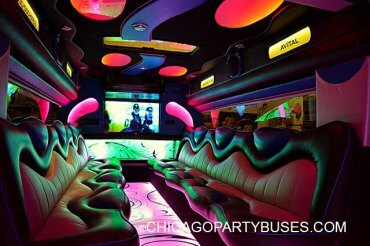 Just a bit different in decor than the previous bus, but with the same awesome perks! 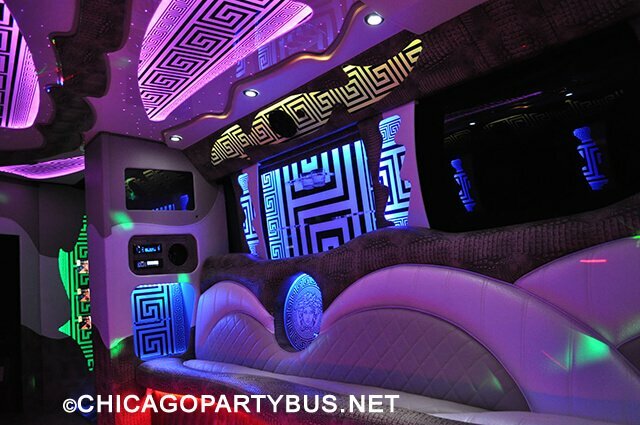 The gorgeous light-up features in this bus are the big draw for most of our customers, and you just haven't seen a party bus until you've seen this one lit up at night! There's an LED stripper pole on this bus with a light up platform beneath it, a laser light show, and underbody and roof LED lighting as well! You'll enjoy the two flatscreens in this bus, and the loud sound system too. There's two ice chests and window shades for your complete privacy on this bus. Decorative LED back-lit ceiling too, and champagne flutes are included. This too is a non-smoking bus. 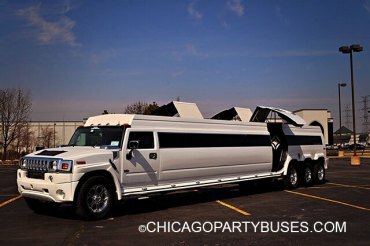 Just a bit bigger than the previous buses, and with awesome amenities for you and all of your guests! 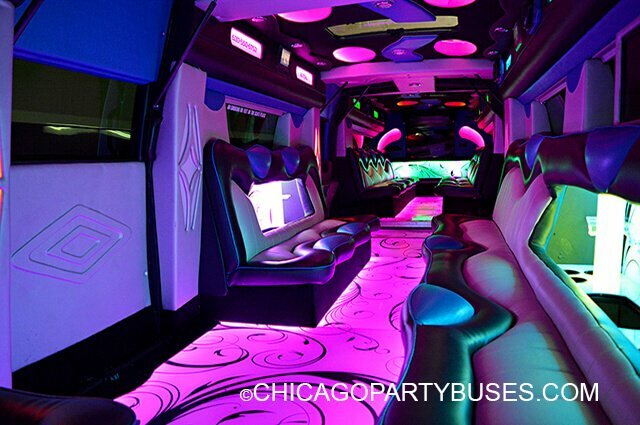 The gorgeous light-up features in this bus are the big draw for most of our customers, and you just haven't seen a party bus until you've seen this one lit up at night! 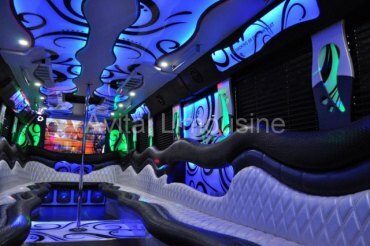 There's an LED stripper pole on this bus with a light up platform beneath it, a laser light show, and tasteful exterior decorative lighting as well! You'll enjoy the three flatscreens in this bus, and the loud sound system too. There's ice chests, and window tinting for your complete privacy on this bus. 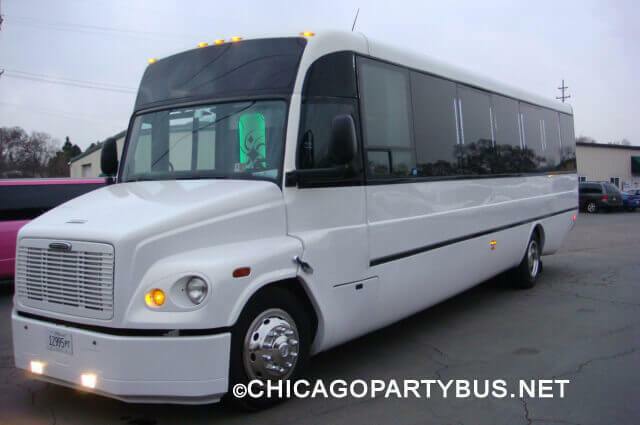 Like the other vehicles in our fleet, this too is a non-smoking bus. Bigger than previous buses giving you and all of your guests the room you need! The gorgeous LED lighting system in this bus is customizable for our customers, and you just haven't seen a party bus until you've seen this one lit up at night, as we have said before! 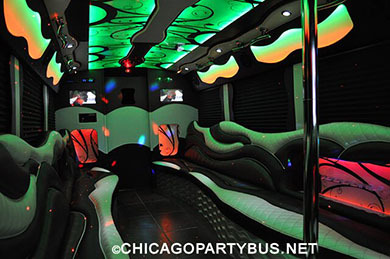 There's a dancing pole on this bus with a light up platform beneath it for amateurs and professionals alike, a laser light show, and tasteful exterior lighting as well! You'll enjoy the built-in LED TV's in this bus, and the top of the line sound system too. 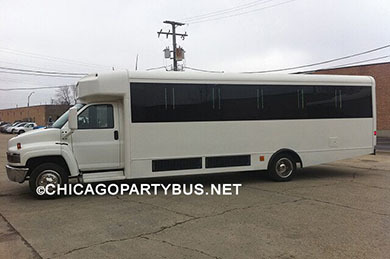 There's ice coolers, and window tinting for your complete privacy on this bus. Like the other vehicles in our fleet, this too is also non-smoking. You'll find that our "entry-level" limousine is far and away the most luxurious limousine in it's class for the Chicago area! 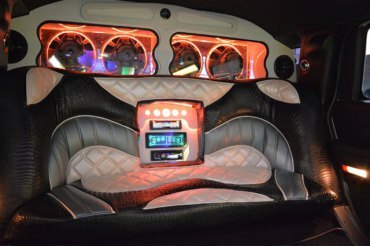 Featuring such high level amenities like an amazing 5500 Watt audiophile sound system, a 37" HD TV, as well as a CD player that allows adaptability to your iPod/MP3 player. 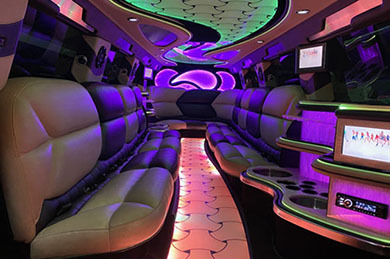 The fun doesn't stop there though, as there's a mood lighting system for the interior with disco lights and laser light show, as well as a dance floor with decorative reflective ceiling. Enjoy some privacy with our VIP section where the guests of honor can spend their time. If you're looking to make a lasting impression when pulling up to your big event... you must check out our luxurious Cadillac Escalade stretch Limousine! There are an unbelievable total of four flat screen televisions in this vehicle, and an astoundingly loud and crystal clear sound system for everyone's entertainment as well. 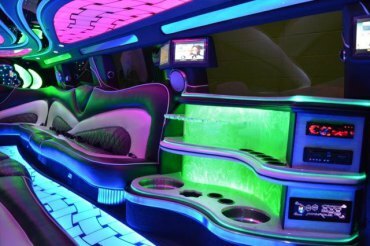 Our disco floor and ceiling lighting really sets the interior decor of this limo apart! And, talk about intimate and romantic... there's even a private VIP area in this limo too! There are multiple bar areas, elegant and oppulent leather seats, and dark tint on all the windows for your total privacy on the road. This, too, is a non-smoking vehicle. 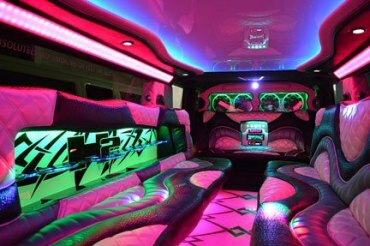 If you're looking to make a big impression, our H2 Hummer Limousine is just what the doctor ordered! There is an unbelievable 42" LED flat screen HD television in this vehicle, and a booming sound system for your entertainment as well. The fiber optic lighting really sets the mood. There are luxurious and spacious bars, cozy leather seats, and dark tint on all the windows for your total privacy on the road. This, too, is a non-smoking vehicle. For an even bigger impression, our Triple Axle H2 Hummer Limousine is just the ticket! 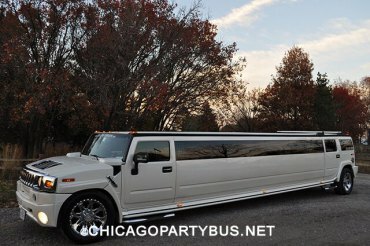 Featuring an unbelievable 42" LED flat screen HD television, and a killer sound system as well for your entertainment. The fiber optic lighting system is perfect for setting the mood. Also, this vehicle has luxurious and spacious bars, custom leather seating, and dark (limo) tint on all the windows for your complete privacy on the road. This is also a non-smoking vehicle.